I want to thank Mr. Eilers for opening his house to us on a very hot day to talk about planning and Finances for our pack for the upcoming year. I was also happy to see both leaders and parents participating. I know that leaders think we are doing a very good job, but it is nice to have some feedback as to where we need to improve and what we can are doing well. 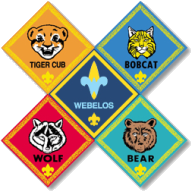 As we start the 2nd year of the newer BSA Cub Scout program, I know that I and the leaders still have a lot to learn about it. The good thing is that there are no major changes to the program this year (that I know of) and I know we had some issues last year but we ended very strong and with the leaders help I do think we can start strong this year. Like every year, between now and the New Year we have a lot of things to get done and we need to work thru some small changes (that I am not too worried about). I do not want to get ahead of myself too much, we need to start at the beginning and the beginning of every year is the school's open house where we get to meet the teachers and advertise ourselves to the school. I know that we will have a lot of Kindergarten parents come up and want to join, but as of right now our council does not have anything in place for them right now (I do know that there are some actions in other councils but we can talk about that later). I am going to ask that if you know of any other parents that are thinking about joining scouts, please have them stop by during the open house or anytime throughout the scout year. The only thing that I will say is that the earlier they join, the better chance they have of going thru the full rank advancement.